Japan is widely known for its extensive list of cute mascots ranging from cute to scary to downright weird. Every few years, a poll is taken and the top 1,000 cutest are ranked by experts and the public alike in never ending competition from the victims of “cute culture.” Tech companies are no different, and its rare to find a major player without a cute face to stick to. We’ve already covered Softbank’s Otosan and NTT DoCoMo’s Docomodake in our coverage of Japan’s three biggest service providers, but what about other electronics companies? Here are a rundown of a few of the more popular ones. J:COM, Jupiter Telecommunications Co., Ltd, is the largest provider of digital television and broadband internet in Japan, and this little guy is its brain child. Never appearing alone, ZAQ is actually a species of little egg-headed beings who inhabit everyday appliances around the house, creeping out every so often to convince residents that they need faster Internet connections and more channels. Created in 2003, he was modeled after the forest sprites found in the beloved Ghibli film Princess Mononoke. 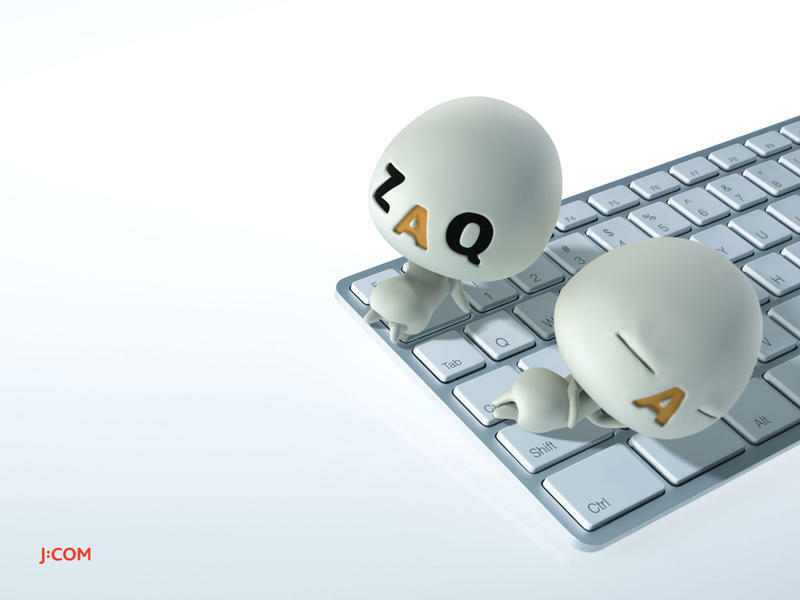 ZAQ is obviously the three leftmost keys on a QWERTY keyboard making his name easy to type, and the letters stand for Zone Access & Quality. Japan Railways Group, the private corporation who took over the government owned national train network running throughout the country, is split into seven branches determined by region. In the Kansai region, where I live, we fall under the JR West railway which covers most of the Osaka, Kobe, and Kyoto Metropolitan area. This guy is our mascot. Ico the Platypus is a blue platypus, obviously, who can be seen on trains and in stations throughout the region. While representing the entire train system, his main job is to advertise the incredibly convenient rechargeable cards. Just slip a few thousand yen onto an ICOCA card, and you can board trains without having to buy a ticket every time you need to ride. Plus, ICOCA’s cards can be used at any vending machine, kiosks, or convenience stores located on JR’s turf if you are in a rush to board a train and can’t find cash. ICOCA is a play on words for “ikouka,” which means “Let’s Go! !” in Japanese. NHK is Japan’s public broadcasting company, but it is mostly infamous for contracting shifty companies to get people to pay the mandatory fee stated in Japan’s constitution. That, and its mascot is one of the more recognizable in some American sects. 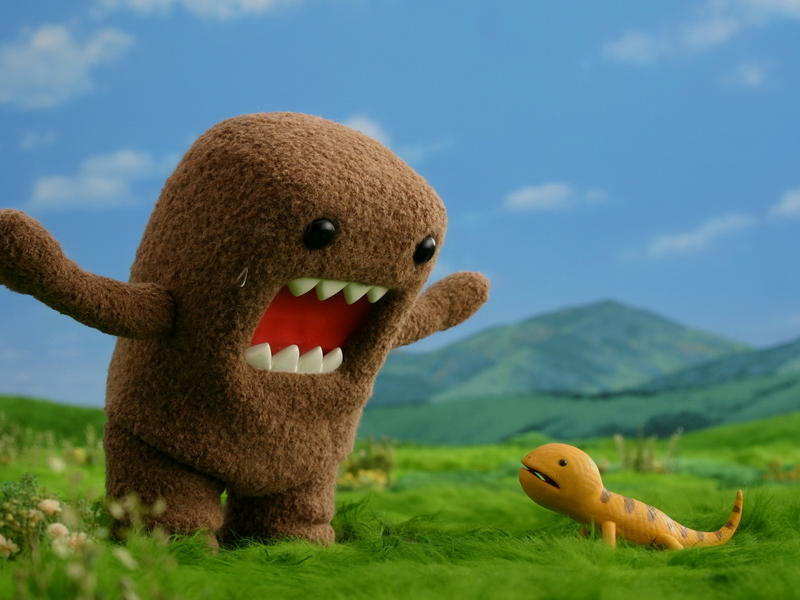 Domo, or Domo-kun as he is often referred to, was created in 1998 in a series of stop-motion animation cartoons to celebrate the 10th anniversary of NHK’s satellite broadcast. He is best known for a permanent look of surprise and fascination, and his saw like teeth, which look quite frightening actually. His favorite food is “nikujaga,” a kind of potato, pork and carrot stew popular with salary-men due to it being easy to make. He lives in an underground cave with this friends and farts a lot. His name “Domo,” doesn’t have a direct translation, but it can be tagged onto everyday greetings like “Domo Arigatou” or “Domo Konnichiwa” meaning “Thank you very much” or “Hello there!” respectively. “Kun” is an honorific used for young boys and “inferior” men. Fuji Media Holdings Inc., or Fuji TV, is a private television company often seen as a rival to NHK due to its influence in Tokyo, Japan’s most populated area. Naturally, this means that their mascots must also be rivals, and Domo-kun would be foolish to not fear this green cutey. Don’t let looks fool you, this is one tough dinosaur. Gachapin began his career in 1973 on a television show called Hirake! Ponkikki, Fuji TV’s brand of Sesame Street for children. 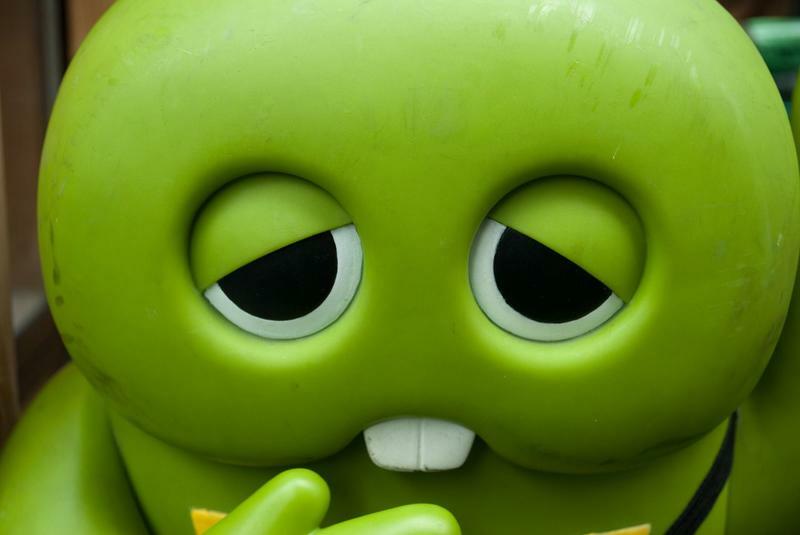 Although he was intentionally modeled to look sleepy, Gachapin never has a dull day in his life as he often attempts many daring stunts and feats like sky-diving, jet-skiing and rock-climbing. He also loves environmental and space science. His endearing popularity has led him to become a mascot for the whole company, and he is rarely seen with his best friend, Mukku, a red yeti. The two often make public appearances together at events, and Gachapin even found himself in the official music video “Read My Mind” from The Killers. In America, we have the Energizer Bunny, a pink rabbit who can’t be bothered by the dangers around him because his battery never stops. Evolta is Japan’s Panasonic equivalent. 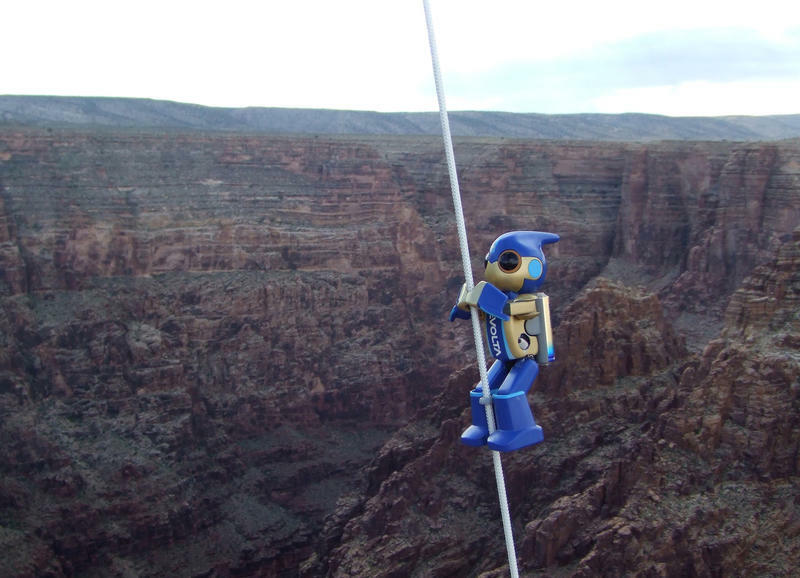 The tiny robot performs daring feats from wrestling to repelling to riding bikes across country. His most extraordinary feet was traveling 500 km on 12 AA batteries. That’s roughly the distance from Tokyo to Kyoto, or half the distance of the country from east to west. LINE has quickly taken off as one of the most prominently used Instant Messaging Services in Asia, taking Japan, Philippines, and Taiwan by storm. Much of its success, 300 million users and climbing, stems from not only the easy usage and wide selection of supported games, but also in the advertising created by its fun cast of characters. Moon and the gang all work at LINE Corp together . Moon is a poor everyman with long nose-hair and a lack of character which is the punchline of many jokes. Brown, the bear, and Cony, the rabbit, are in a relationship, and even though Cony is the most expressive of the bunch, her boyfriend Brown never changes his face. James, the blonde, is a narcissist who only works at the company because his father is the president. He’s not as bad as he seems. They all work together for Boss, the section leader who runs the ship with an off-hands attitude. Each of the characters can be found in LINE’s exclusive games, and they act as stickers to be added to posts thanks to their expressive faces. They even have their own YouTube cartoon highlighting the every mundane activities that go on at LINE Corp. Relatively new to the mascot scene in Japan, they probably have more recognition now throughout the world than most. 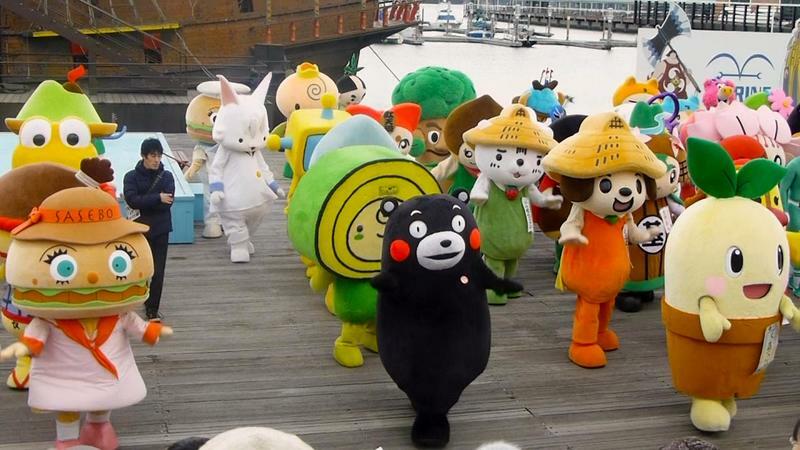 We’ve only scratched the surface of mascot culture in Japan, do you have a favorite we haven’t mentioned?